Critical infrastructure security is the area of concern surrounding the protection of systems, networks and assets whose continuous operation is deemed necessary to ensure the security of a given nation, its economy, and the public’s health or safety. As far as security is concerned, some areas require special attention because of their strategic importance and the threats they attract - especially terrorists. Such is the case of government and military sites, some industrial facilities, but also all transportation infrastructures - particularly exposed to terrorist risk. In all these situations, the challenge is to simultaneously ensure smooth infrastructure operation and optimal security. 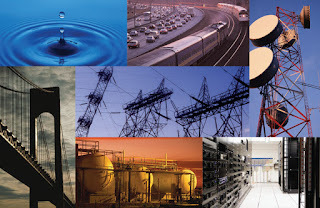 Critical infrastructure includes airports, industrial plants, public transportation, governmental sites and public sites. Making public transportations safer and more secure requires the integration of a number of technologies: surveillance of moving vehicles, stations, control centers, etc. Public sites and areas like museums, tourist sites or pilgrimage sites require the mobilization of a wide range of resources to ensure both public protection and smooth circulation, so that each site can fulfill its mission safely. An industrial site has to be simultaneously secure, reliable and efficient. It is necessary to ensure a high level of safety and security for effective production as well as growth of industries.